Snowboarding is insanely cool and a lot of fun when you get the hang of it. However it’s also harder than it looks, and a lot of those who try it give up after a year. This is usually because they don’t take the time to master the basics and get impatient. Here are the most basic basics of snowboarding, including everything you need to know before you start out. Dress the Part. Yes, starting an article about snowboarding by talking about your outfit might seem like a bit much, but trust us, having the right clothes will make a big difference to how successful your first attempts at snowboarding will be. First, you need a helmet. No, shut up, you really need a helmet. If you’re going snowboarding there’s plenty of opportunities to whack your head on things, and you need your head, so protect it. For your coat and pants you actually want something fairly light. You’re going to be exerting yourself, so you don’t want to end up stewing in your own sweat. Basketballs shorts or pyjama pants under your snow pants should do the trick. Don’t wear jeans. No really, trust us on this. Next you’ll need the bindings. These are important, don’t use plastic strips, use rubber instead, as it’s less breakable. Meanwhile, your boots should be stiff to avoid breaking or spraining your ankles. Make sure you always get a good fit with these. Assume the Position. Now you’ve got the gear, you need to actually get yourself set up to do some snowboarding, which means finding a comfortable position. Decide which foot you want to be in front. To do this, find some ice, run and then jump to slide across it, putting one foot in front of the other. The foot that landed forward is the one that you want to be in front on your board. Once you know that, you can choose how far apart you want your feet to be, but ensure your heels are closer together than your toes. Go For a Ride. Now you’re ready to try the basics. Keep your knees bent and your arms at your sides and look straight ahead without slouching or leaning forward. Put your weight onto your forward foot to build up speed, and lean back to slow down. When the time comes to steer, you can use either your heels or your toes. To turn with your heels, lean onto them a little, bending your knees some more, then once you’ve turned straighten out again. To turn with your toes move as if you’re trying to stand on your toes, causing you to lean in that direction and making you turn, again, straighten out once you’re pointing where you want to go. Try Some Tricks. This is where it gets a little bit "tricky". 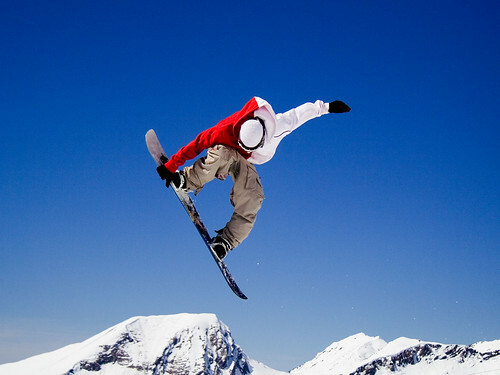 The first trick most snowboarders learn is an Ollie, a type of jump. Lean onto your back foot, pulling your front foot into the air, then push your back foot off the ground, launching yourself into mid-air. Once you’ve mastered this, if you’re feeling particularly adventurous, try twisting your body in mid-air to make your board spin round 180 degrees. Make sure you lend level, or leaning on your back foot. Once you’ve mastered that, you’ll be able to really start experimenting. Article by Alex Narracott, founder and CEO of Much Better Adventures and is a particular fan of Morzine.